Home News Social Trends UST Student Horacio Castillo III surfaced another person of interest in the hazing. Aeron Salientes arrived at the National Bureau of Investigation on Friday around 6 p.m., maintaining he is innocenct on Castillo's death. "Here I am, appealing to the nation...I have to clear my name. Wala po talaga akong info kung anuman ang nangyayari at anuman pong mga activities nila (I really don't have information on what happened and their activities)," Salientes said. Salientes was among the 20 members of the fraternity under the Immigration Bureau's lookout order. He said he was not in the area when the hazing occured, noting he has CCTV footage to prove that he was in Pampanga at the time. Salientes also said although he is a member of the fraternity, he is against hazing practices and claimed to have never joined any hazing activity. As Salientes is not yet a suspect in the case, he will not be detained. This comes hours after John Paul Solano, one of the principal suspects in the case, surrendered to authorities, claiming he had nothing to do with the student's death. Solano said he was not at Castillo's hazing and that he was only called to help resuscitate the victim. He is now under the custody of the Manila Police District's Homicide Division. 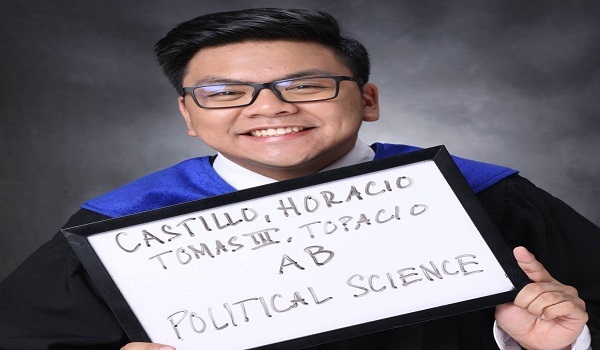 Castillo, a 22-year-old UST law freshman was reportedly found on Sunday morning in Tondo, Manila after he took part in hazing rites of the Aegis Juris Fraternity. Castillo was declared dead at the Chinese General Hospital later that day, with the initial autopsy report saying he succumbed to hypertrophic cardiomyopathy or thickening of the heart muscle. According to a police report, Castillo had hematoma or bruises on both upper arms. His body bore several marks of candle wax drips all over his body. Solano had told police that he found Castillo's lifeless body and brought him to the Chinese General Hospital. Upon his surrender today, Solano said he lied. Coronel said in a Wednesday press briefing that Solano recruited the victim to join the fraternity. Coronel, however, added two other principal suspects - UST law student Ralph Trangia and his father Antonio - allegedly owned the car that transported Castillo's body to the hospital. "Clearly John Paul Solano, with the assistance and cooperation of Antonio Trangia and Ralph Trangia, deliberately misled our operation to the death of Castillo by providing us false and fraudulent statements. They are now considered as suspects in this investigation," he said. The Bureau of Immigration said on Thursday the younger Trangia left the country for Taiwan on Tuesday. His departure was a day before the DOJ issued an Immigration Lookout Bulletin Order against him, Solano and 14 other people involved in Castillo's hazing.